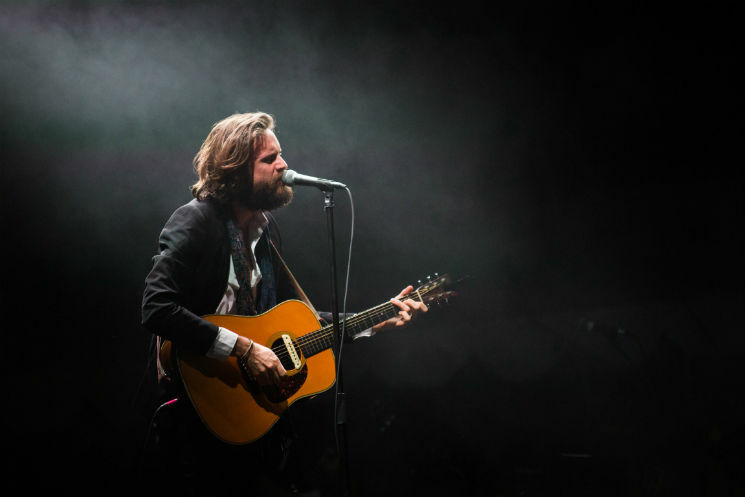 It's hard to believe sometimes that Joshua Tillman, aka Father John Misty, was a drummer for the Fleet Foxes; he's a natural born front man. Last night (May 22) on the Bigfoot Stage at Sasquatch, he sang, danced and strummed with the stage presence of a 40-foot tall giant; I couldn't imagine a scenario in which he wasn't the dancing, all-eyes-on-me centre of attention. Tillman opened the show with "I Love You, Honeybear," the title track from his 2015 album. The show only built momentum, erupting in a blaze of energy during a stunning performance of "Bored in the USA." These are tales from the heart — most of them describe misadventures or his relationships — and fittingly, his banter with the audience ranged from cynical to whimsical to hilarious. Tillman's wild dance moves and aggressive performance had the entire audience captivated. At one point during the set, Tillman clutched onto a nearby cameraman, stared into the camera and sang his lyrics to the audience through the big screen. Overall, it was a very tough act to follow. What Tillman has recorded on I Love You, Honeybear is an achievement, and the way he performs it live is absolutely captivating.